I have decided to take a look back at some of my first recipes that ever made it to Clean Eating Goddess. I can’t believe I’ve been working on this blog for almost three years. It has been SO much fun and a great hobby. 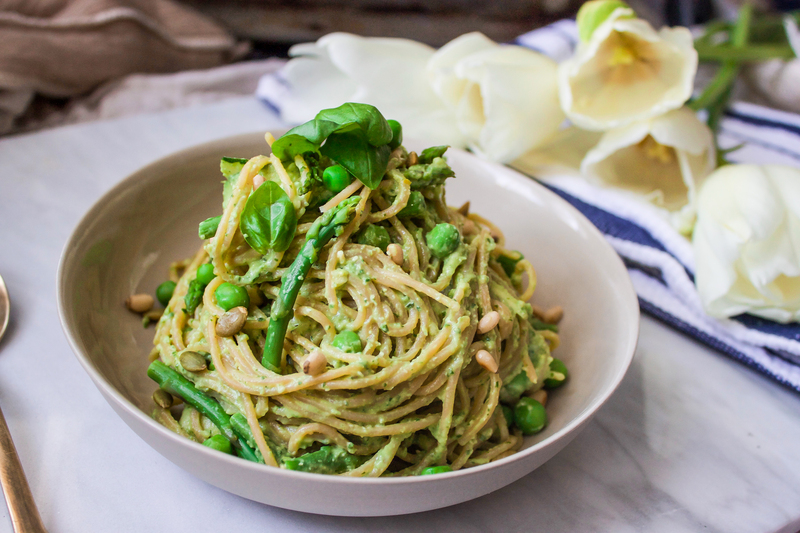 Now that spring is finally here, I was reminded of this green goddess pasta I made years ago. 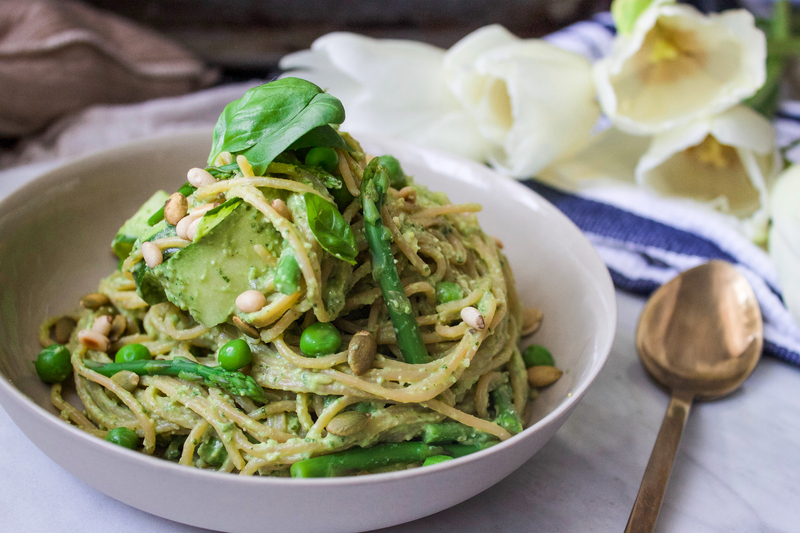 I reworked the recipe slightly to include a chickpea pasta, shaved zucchini and asparagus tips for the perfect light dish. The pasta is loaded with protein on its own so there is no need to add any meat or fish. When buying pastas made from beans, be sure to look where it comes from and that the only ingredients are the bean flour itself. 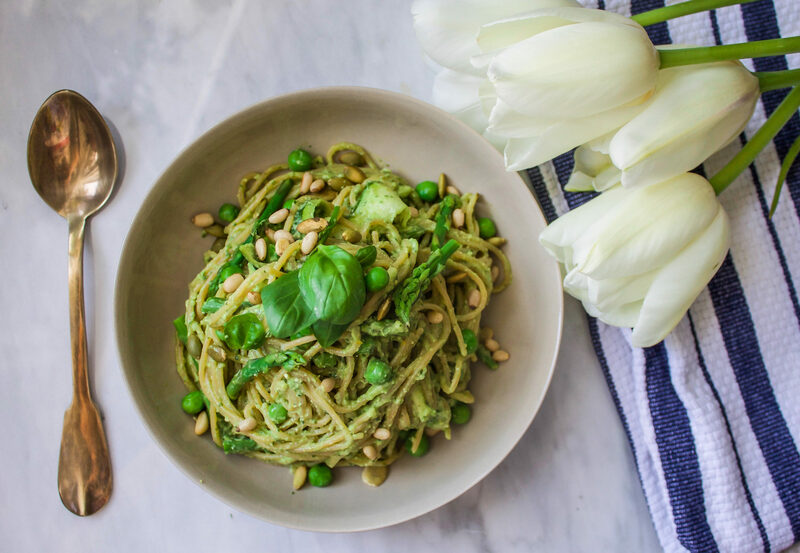 Of course, you can do this with store bought pesto, but making it yourself cannot be beat! I leave out the cheese and add a little extra salt, lemon zest and a handful of spinach for bright fresh flavour as well as a vibrant colour. The cheese is mostly added for a salty component and really isn’t missed when left out. By adding the pureed avocado, you achieve the same creamy texture without the added dairy. I ate it cold, but would work wonderfully warm as well. I hope you love this new revamped recipe! It is full of protein, good for you fats and of course LOTS of flavour! 2. 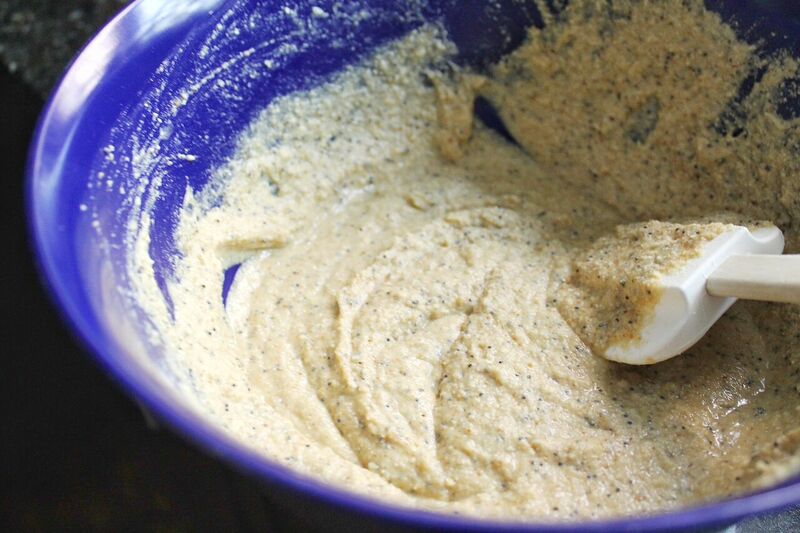 Place all of the pesto ingredients except for oil in your food processor. Pulse. Slowly incorporate the oil while the machine is running, until a smooth paste has formed. Continue blending for 15 seconds to thin the sauce out. 3. Remove pesto from processor bowl and set aside. Now add your avocado flesh into the bowl and process until smooth. Place in a bowl and mix with fresh lemon juice so it does not brown. 4. Cook pasta according to directions. When the pasta is 2-3 minutes away from finishing, into the same pot, add your asparagus and peas. This avoids having to clean an extra pot! Drain and rinse with cold water to keep the the bright green colour. 5. For a warm pasta, put pasta back into pot on med-low heat. 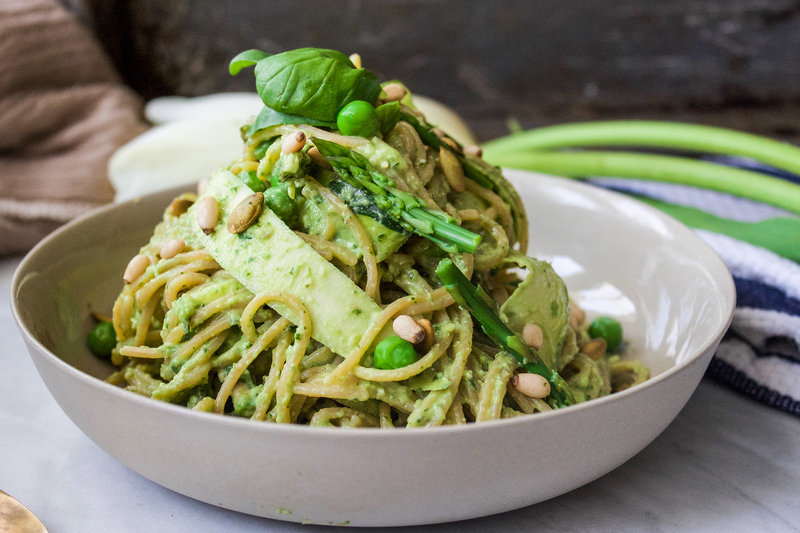 Add 2 heaped tbsp of pesto, mashed avocado, half of the peas, shaved zucchini, asparagus and nuts. Toss until creamy and combined. For a cold pasta, mix in a large bowl. 6. Plate and top with remaining nuts, peas, and asparagus. Finish with a fresh squeeze of lemon and some freshly ground pepper. I posted this recipe over a year ago now and I decided it was time to give it a revamp in terms of ingredients as well as pictures. 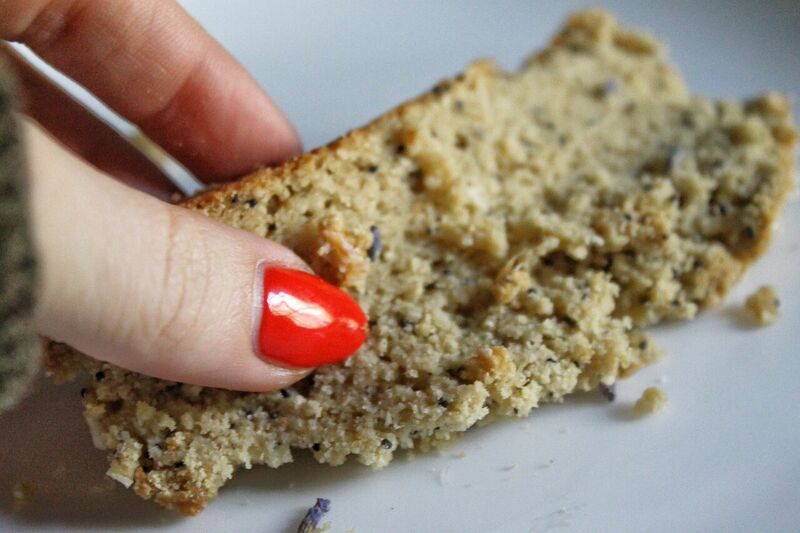 I hope you all love this new recipe, and give lavender a try! Lavender has been one of my obsessions for many years now. My best friend worked at a bakeshop here in Montreal and often came home with leftover cupcakes from the day. On a Monday evening, she brought home a beautiful purple lavender cupcake and I was instantly hooked. Monday’s (only day they had lavender cupcakes) became a little brighter for me as I indulged in the buttery cake that smelled of perfume. 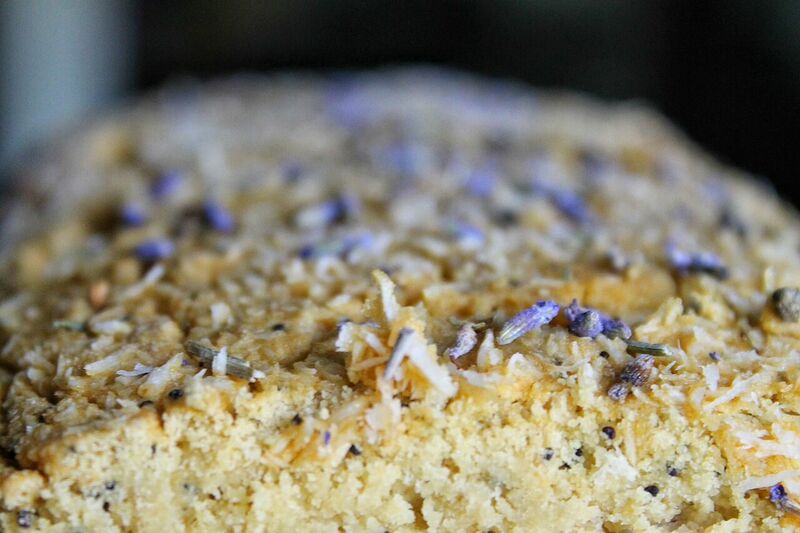 Lovely lavender cakes became a birthday ritual for me but often resulted in bloated, uncomfortable evenings. So on this journey to clean eating, I have successfully recreated my favorite dessert. 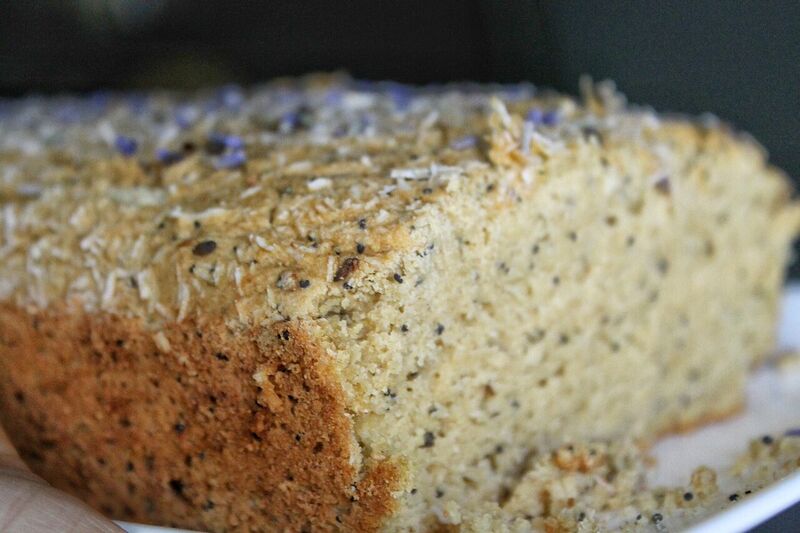 Although I missed the butter cream frosting, the addition of coconut flakes and poppy seeds made the loaf rich and flavourful. 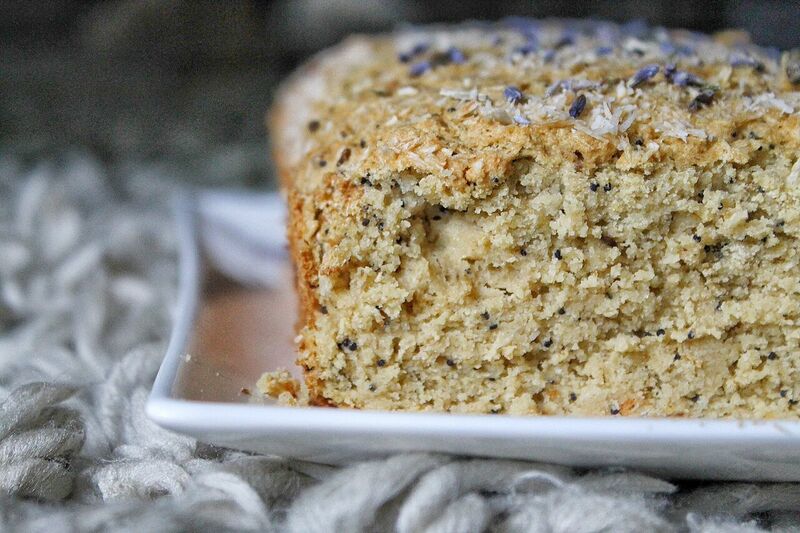 This recipe is grain-free, gluten-free, dairy-free and sugar-free. Like all my recipes, it uses all natural ingredients. This was my first time using millet flour and I have to say, I was quite impressed. There was no unwanted “gluten-free” taste to be found, plus it has an incredible crumb-cake like texture! I highly recommend this flour for cakes and muffins. 1. Position a rack in the lower third of the oven and heat the oven to 350°F. Grease loaf pan with coconut oil, or line with parchment paper. 2. 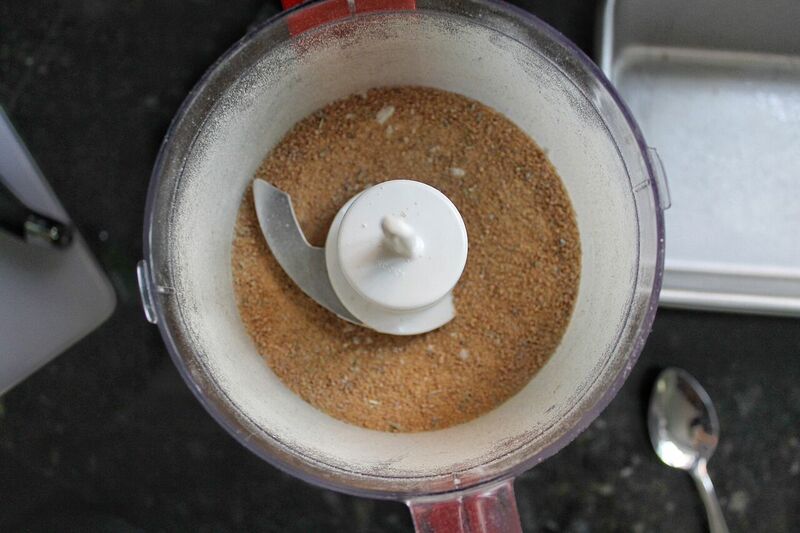 In the bowl of a food processor, add you your 1 tbsp lavender and coconut sugar. 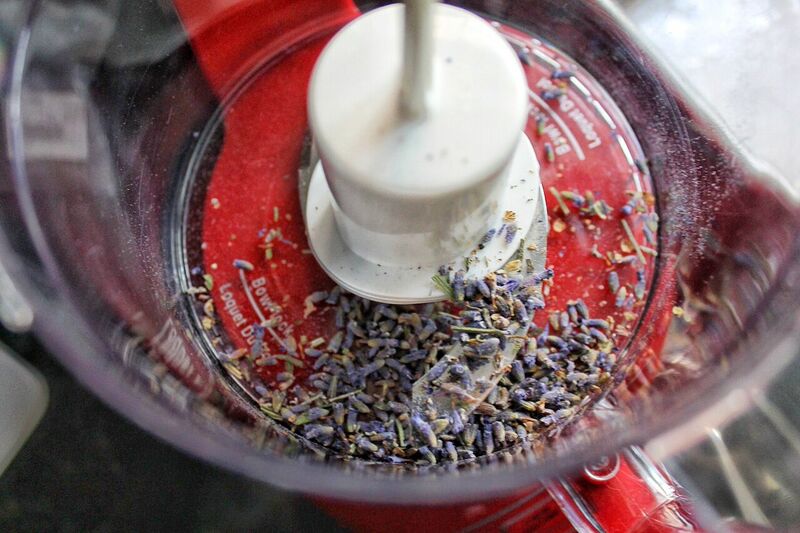 Process until the lavender has turned into a powder. 3.In a large bowl, combine the millet and coconut flour, coconut sugar, 1/4 cup coconut flakes, poppy seeds,, baking powder, and salt. Whisk until well blended. 4.In a medium bowl, add the almond milk, eggs, melted coconut oil and vanilla. Whisk until evenly combined. Pour the wet ingredients over the dry ingredients. Using a spatula, gently fold until combined. Scrape the batter into the prepared pan and spread evenly. Tap the pan on the counter a few times to even out the batter. 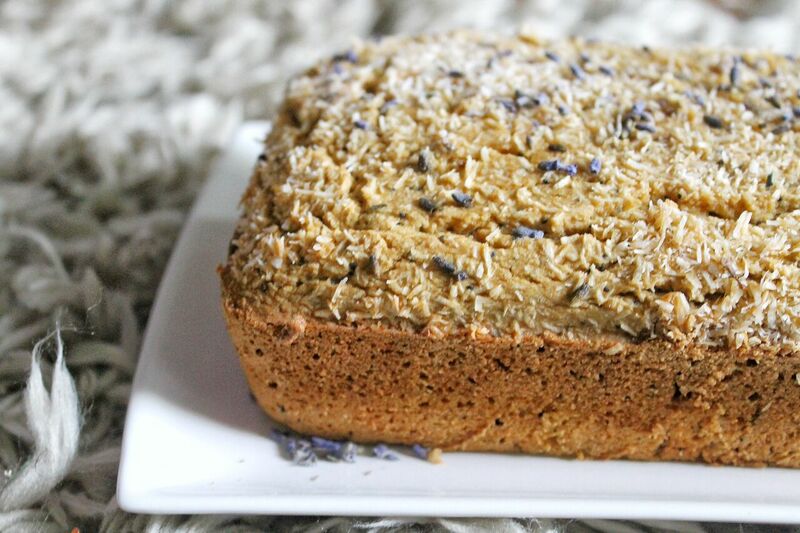 Top with remaining coconut flakes and more lavender if you desire. 5. Bake, rotating halfway through, until the top is golden and a wooden skewer or toothpick inserted in the center comes out clean, 50 to 55 minutes. Allow to cool for 5-10 minutes and then invert the cake onto a cooling rack and allow to finish cooling for another 30 minutes. Serve with fresh blueberries and tea!